At some point in our lives, most of us have heard about how our ancestors fought for some of the luxuries we enjoy today and how we stand on their shoulders. But have you ever thought about what was fought for locally? For example, many people live in Pilsen and others have driven by or attended Benito Juarez High School but not many know the history behind the community, the school and the mural. So what did our ancestors in the Pilsen community fight for? The Mexican community struggled because they did not have a nearby high school to send their kids to. The community wanted a high school in Pilsen so the local kids did not have to go to other neighborhoods and experience violence by gangs. Our ancestors fought for a new high school in Pilsen and later commissioned a mural to represent the struggles experienced by the teenagers and adults in the community. Before Benito Juarez High School was built in the mid-1970s, families in Pilsen had to send their kids to Harrison High School, which is far west of Tilden High School, which is in Back of the Yards. Due to the many different gangs it was always a battle for the kids to get to school, survive there and make it back home safe. “The school system opposed the building of a new high school in Pilsen, so basically the struggle was long and hard and it was a big deal when they finally closed Blue Island to build Benito Juarez High School,” said Len Dominguez, owner of Carlos and Dominguez Fine Arts Gallery. Dominguez, former principal at Benito Juarez played a big role in the positive change that took place. Once the school was built, Dominguez’s goal was to make it the best high school possible. He did not see why the best and smartest kids had to leave the neighborhood to go to a better school elsewhere, but he also encountered resistance to his plans. Dominguez said that he got into a few community battles with a group of activist who opposed his decision to introduce Chinese to the schools curriculum. “They would say things like ‘what do you mean Chinese? Our kids can barely speak English’…and my response was, ‘that’s exactly the problem, you underestimate the kids, you think they can’t do it, and they think they can’t do it … but I know they can do it.’ You have to challenge them and give them a good curriculum. In the year 2000, I said, ten years from now, anybody walking around with a degree in their hand that speaks English, Spanish and Chinese will travel the world and someone else will pay for it…and of course, that’s true now,” said Dominguez. Some of the mothers that fought to build Benito Juarez High School created a panel and held a competition for a professionally commissioned mural. Various artists submitted designs and an agreement was made, among them, that no matter who won the contest, all the artist were going to work on the mural together. 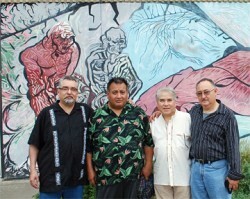 In 1979, artists Jimmy Longoria, Oscar Moya, Marcos Raya, Robert Valadez and Salvador Vega worked through their summer on La Esperanza, a large mural that represents the struggles and aspirations of Mexican youth and their families. Artist, Oscar Moya said that he remembers how alliances had to be made with the local gangs so they wouldn’t paint over it over their mural. “It was their turf and we had to actually ask permission that was something that was done in that time, some of them even helped paint. In regards to having Benito Juarez High School built, not having to go to school somewhere else, it did help the teenagers, the community and their lives,” said Moya. 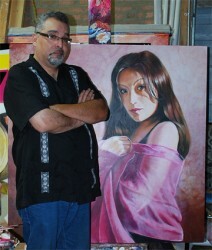 Artist, Roberto Valadez said that helping on this mural launched his career as an artist. “It was the first time they let me paint on anything. I was just a kid helping out, cleaning brushes and they let me paint here and there. I had a creative impulse and I knew how to draw,” said Valadez. “The mural movement was real strong. It was an identity thing; being born and raised here you don’t get a lot of information about being Mexicano. There are a lot of people that don’t realize what it took for us who were born here. When I was a young guy in grammar school, we couldn’t speak Spanish. It was insulting that we couldn’t speak our Spanish, that wasn’t right. They insulted us and asked if we were stupid, they put us down. How things have change, now Spanish is a big part of everything,” said Salvador Vega. Moya, Valadez, Dominguez and Vega remember how the Pilsen community was changing. Urban renewal was happening, people were getting shifted and pushed out of neighborhoods and a small group was rapidly buying real estate- change was happening fast. Moya said he remembers that Casa Aztlan along with many other organizations and artist assisted the Mexican community in helping them buy their piece of real estate to avoid getting pushed out of their neighborhood. The community was also encountering political battles. “It took a fight to get the first Mexican alderman in Pilsen because they had the “old-guard” that controlled this area, the same thing happened in Little Village. The political people tend to hold on to the old voters who want to control everything,” said Dominguez. Interested in meeting the artist or learning more about their experience, stop by on Friday Sept. 9th between 7pm-10pm at the Carlos and Dominguez Fine Arts Gallery, 1538 W. Cullerton Street. This event is free and open to the public.